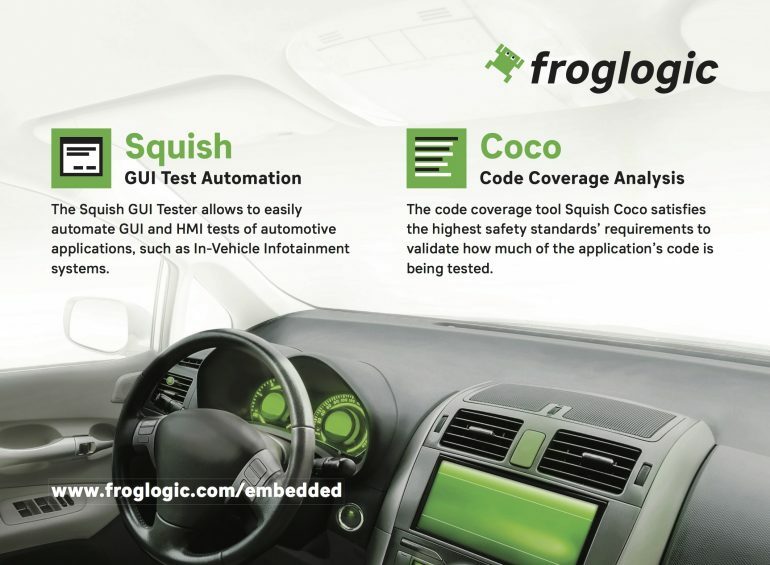 froglogic, an early anticipator for the need for GUI test automation and code coverage tooling for the rapidly transforming embedded markets, expanded its offerings to cover many of the embedded HMI testing needs. Many renowned companies in the automotive industry as well as other embedded industries have already adopted froglogic’s tools for the quality assurance of the their embedded software development processes. After very successful exhibitions at the Embedded World 2017 in March and ESC in May, froglogic will also present and demo its embedded software testing and coverage solutions at the Automotive Testing Expo Europe. You will find froglogic at the booth #1578. For any questions, if you’d like to schedule a meeting with a froglogic representative, please contact sales@froglogic.com. froglogic GmbH is a software company based in Hamburg, Germany with additional offices in the USA and Poland with over 3,000 customers world-wide. froglogic is well known for its automated testing suite Squish with its flagship product Squish GUI Tester, the market-leading automated testing tool for GUI applications based on Qt, Java AWT/Swing, SWT/RCP and JavaFX, Mac OS X Carbon/Cocoa, Windows MFC, .NET and WPF, iOS Cocoa Touch, Android and for HTML/Ajax/Flex-based web applications running in a variety of web browsers. In addition, froglogic offers the professional, cross-platform C, C++, C# and Tcl code analysis tool Coco Code Coverage. Find out more about us and our products at https://www.froglogic.com.